Success for al-Qaeda in Syria? This article considers how far one can describe al-Qaida's experiences in Syria as a success. A common line of analysis has been that al-Qaida has been playing a more successful long-term game in Syria as opposed to its more aggressive rival, the Islamic State. This article examines that argument more closely through exploring the nature of the relationship between al-Qaida and Hay'at Tahrir al-Sham, the latest successor initiative to the original Syrian al-Qaida affiliate Jabhat al-Nusra. The author considers the viability of Hay'at Tahrir al-Sham's project and the future of al-Qaida in Syria, reaching a negative long-term prognosis. One of the most common concepts to describe al-Qaida's presence in Syria has been that of 'playing the long game.' That is, whereas its rival the Islamic State focused on quickly defeating other Syrian insurgent groups and opponents, establishing a state project and imposing the harshest aspects of Islamic law (i.e. the hudud punishments for serious crimes), al-Qaida has chosen to embed deeply within the insurgency fighting the Assad regime. Thus, al-Qaida affiliates and al-Qaida-linked groups have generally proven themselves to be valuable military partners for other factions, while not working to impose all aspects of Islamic law immediately on the populations in their zones of control and influence, but rather working to condition the locals to accept their imposition eventually. The main group considered to represent this approach has been Jabhat al-Nusra, also known by the fuller name of Jabhat al-Nusra li-Ahl al-Sham (translated: "the support front for the people of al-Sham"). Similarly-aligned groups ideologically, such as the Turkestan Islamic Party primarily consisting of Uyghurs from East Turkestan in China, have also used the slogan of nusra li-Ahl al-Sham. However, the focus here will be on Jabhat al-Nusra and its successor organizations, being much larger entities than the likes of the Turkestan Islamic Party. Publicly announced in January 2012, Jabhat al-Nusra initially made its mark with high profile bomb attacks but soon became established as an important military actor in the insurgency. Its global jihadist orientation was clear in the distribution of its content on jihadi forums. However, no specific affiliation or links were publicly declared. This was in keeping with the approach of other jihadi groups that emerged in the wake of the Arab Spring, such as the Ansar al-Shari'a movements in Yemen, Libya and Tunisia. It was only an audio message in April 2013 by Islamic State of Iraq leader Abu Bakr al-Baghdadi, who had helped set up Jabhat al-Nusra and wanted to subsume it unilaterally under his group, that prompted Jabhat al-Nusra's leader to declare an affiliation with al-Qaida. This was likely in the hope that al-Qaida leader Ayman al-Zawahiri would rule in his favour in the dispute with Baghdadi. However, the declaration of the al-Qaida affiliation did not generally lead to Jabhat al-Nusra's isolation from the broader insurgency, as many groups continued to cooperate with it on the battlefield. In the end, with the expansion of Baghdadi's Islamic State in Iraq and al-Sham (ISIS) in Syria, Jabhat al-Nusra took the side of the insurgency against ISIS in the broader infighting that erupted across the north and east in early 2014, while al-Qaida central issued a formal statement denying that ISIS had any links with it. Al-Qaida's turn against ISIS reinforced a widespread line of defense of Jabhat al-Nusra as a vital military partner and part of the broader insurgency. This was so even as Jabhat al-Nusra lost its most valuable assets in the east of Syria to ISIS by summer 2014 and occasionally targeted groups for elimination, most notably the Western-backed Syrian Revolutionaries Front in Idlib province in October-November 2014. Indeed, in early 2015, Jabhat al-Nusra came together with the Salafi group Ahrar al-Sham to set up and lead the Jaysh al-Fatah alliance that drove out the regime from almost all towns in Idlib, including the provincial capital itself. Hence, despite some severe bumps, Syria's al-Qaida affiliate had successfully affirmed its status by 2015-2016 as a leading actor in the insurgency, prompting warnings that the group could pose a bigger long-term threat to the United States than the Islamic State. Today, warnings of a major al-Qaida threat emanating from Syria continue to be repeated, with U.S. diplomat Brett McGurk characterizing Idlib province, the main epicenter of the insurgency today and dominated by the Jabhat al-Nusra successor group Hay'at Tahrir al-Sham, as the "largest al-Qaida safe haven since 9/11." In an opinion article for the Daily Beast, Charles Lister argued that "al Qaeda stands to benefit the most" from continued instability in Syria deriving from Assad's remaining in power , highlighting that "al Qaeda has embedded itself deeply within the anti-Assad movement, attaching its fate to that of the indigenous revolution." How justified are these fears of an al-Qaida threat emanating from Syria for the long-term? This article explores this question more closely by examining two issues. First, it is necessary to explore the nature of al-Qaida's relationship with Jabhat al-Nusra and its successor organisations, firstly embodied in Jabhat Fatah al-Sham and then Hay'at Tahrir al-Sham. Second, this article looks at the current direction of Hay'at Tahrir al-Sham's project, its future viability that is connected to the wider fate of Syria's insurgency, and what that fate means for al-Qaida in Syria. The Break from al-Qaida: The Plan All Along? While Jabhat al-Nusra was able to form military alliances and joint administrations with many other insurgent actors, its explicit al-Qaida affiliation posed a problem for the often discussed aspiration of unity among the various factions. Understandably, other groups feared that a real merger with Jabhat al-Nusra would lead to being internationally blacklisted as terrorists, targeted in US airstrikes and losing support from foreign state patrons. For instance, in early 2016, talks for a merger between Jabhat al-Nusra and other factions - in particular Ahrar al-Sham - were raised, only for the idea to be rejected on the grounds of Jabhat al-Nusra's al-Qaida affiliation. Ayman al-Zawahiri was clearly aware of the discussions, as illustrated in his speech "Go forth to al-Sham," released in May 2016 but recorded in February/March of that year (the time lag existing on account of the logistics of communication channels with the outside world). In his speech, he portrayed the jihad in Syria as representing the best hope of the ummah for establishing an Islamic government, and emphasized that this jihad needed to be defended. On the issue of al-Qaida affiliation, Zawahiri appeared to be ambiguous: while he stressed that al-Qaida itself did not seek to rule and would go with the hypothetical Islamic government that goes above organisational ties, he also said that he did not think that international powers would be content simply with an end to Jabhat al-Nusra's ties with al-Qaida, but would rather seek to humiliate it further. Fresh impetus was given to the notion of breaking ties with al-Qaida when reports emerged around the beginning of July 2016 regarding proposals for a joint U.S.-Russia campaign to target Jabhat al-Nusra. On July 28, Jabhat al-Nusra was officially rebranded as Jabhat Fatah al-Sham ("Conquest of al-Sham Front"), declared to have no affiliation with any "external entity." The occasion of the announcement was the first time in which Jabhat al-Nusra's leader Abu Muhammad al-Jowlani revealed his face publicly, and stated that the change came in accordance with the "general guidelines and directives" of al-Qaida's leadership. Hours before the actual announcement, Jabhat al-Nusra's media wing al-Manara al-Bayda had released an audio message by Abu al-Khayr al-Masri, identified for the first time as Zawahiri's deputy. In this message, he was urging for the necessary steps to be taken to protect the jihad in Syria and strive for unity above organisational ties, replaying an excerpt from an old Zawahiri speech released in January 2014, which stated that unity should come above party affiliation. The media presentation by Jabhat al-Nusra on that day suggested a move coordinated with Zawahiri. For instance, the particular wording regarding affiliation implied that there could still be ties with al-Qaida figures who had come to Syria (e.g. Abu al-Khayr al-Masri), rather than a true break with al-Qaida. In addition, Jowlani stated in his announcement that Zawahiri and the al-Qaida leadership would continue to be an exemplar to follow. Some jihadi media outlets contributed to this impression, with the pro al-Qaida outlet al-Fustaat posting some days before the announcement that "Jabhat al-Nusra will soon sever ties with al-Qaida with the permission of Sh. Ayman al-Zawahiri." Compelling as this interpretation of a stroke of al-Qaida genius and guidance might seem, one to which this author also subscribed, it faces two problems. First, the short-term impetus for the rebranding, and the actual rebranding, occurred within the timeframe of approximately one month. Yet as noted with the Zawahiri audio recording released in May of that year but actually produced 2-3 months earlier, there is a considerable delay in the communication channels between Zawahiri and the outside world. While it is clear that Abu al-Khayr al-Masri, being based in Syria himself, gave permission for the rebranding and shift in affiliation, it seems implausible that the matter could have been relayed to Zawahiri and a response relayed back within the time-space of one month. Second, there was by no means unanimous backing within the Jabhat al-Nusra leadership for the rebranding. For instance, the Jordanians Imad al-Toubasi (Abu Julaybib) and Bilal Khuraisat (Abu Khadija al-Shari'i) both refused to join Jabhat Fatah al-Sham. Both men clearly rejected the idea of breaking ties with al-Qaida and the oath of allegiance to Zawahiri, and feared that the ideological project would be compromised by merging with more 'moderate' factions; the fear of 'dilution', it should be noted, is implied in Zawahiri's speech released in May 2016. If the rebranding had been approved and guided by Zawahiri, why would these men have refused to join the new entity? Surely they would have been aware of Zawahiri's supposed role in the whole matter? When one takes into account these 'purist' concerns about the rebranding, another interpretation emerges behind the initial wording of not being affiliated to an "external entity": that is, that this phrasing was an attempt to address the 'purist' concerns, and reassure them that the rebranded entity would still remain an al-Qaida project in its ideological essence. Subsequent pronouncements moved away from this technical-sounding language likely in the realisation that the 'purists' could not be won over. In any case, these hardliners could not muster sufficient support to cause a serious split within the organisation, on account of the disagreement. The rebranding as Jabhat Fatah al-Sham should not be seen as something that was in the works by al-Qaida all along. Rather, it was a response to a particular set of circumstances that probably threatened to fracture the group. There had likely been efforts going on for several months to push for a new non-al-Qaida-affiliated entity by the likes of Saleh al-Hamawi, a founding member of Jabhat al-Nusra who was expelled in summer 2015 for his criticisms of what he saw as the group's lack of pragmatism, but who still retained a network of supporters in the group. The threat of an American-Russian campaign to target Jabhat al-Nusra seemed to give those efforts additional force in July 2016, thus prompting Jowlani to have serious consultations with Abu al-Khayr al-Masri and the leadership on the issue of the al-Qaida affiliation. Following the formation of Jabhat Fatah al-Sham, one of the goals was to renew merger talks with other factions, in particular Ahrar al-Sham. Now that the al-Qaida affiliation was dropped, one could say that the ball was in the court of Ahrar al-Sham and other factions to merge. As was widely expected at the time by analysts, the shift to Jabhat Fatah al-Sham failed to give rise to new mergers. The outside world considered Jabhat Fatah al-Sham to be a mere front for al-Qaida, and so any mergers with the group would again risk seeing other factions blacklisted and losing outside support. Thus, the mainstream Ahrar al-Sham leadership, with its close ties to Turkey, refused to merge with Jabhat Fatah al-Sham, even as the pressure to merge intensified with the regime's recapture of Aleppo city in its entirety in December 2016, a major blow to the insurgency that gave rise to a sense of a wider crisis. Among those pushing for a merger with Jabhat Fatah al-Sham was a hardline faction within Ahrar al-Sham led by Hashim al-Sheikh, who formed his own Jaysh al-Ahrar subgroup in Ahrar al-Sham, and groups that had developed close working relationships with Jabhat Fatah al-Sham, such as the Islamist and opportunistic Harakat Nour al-Din al-Zinki, which once received CIA support through an operations room in Turkey that was cut off in 2015. The end of CIA's support was due to the group's criminal activities (e.g. kidnapping Italians in 2014) and a close working relationship developed with Jabhat al-Nusra. Only a round of infighting helped bring about actual mergers though, as Jabhat Fatah al-Sham, perceiving a conspiracy to isolate it but likely also wishing to seize control of some key supply routes, began by launching an attack on Jaysh al-Mujahideen, a CIA-backed group that had a presence in the west Aleppo countryside. The round of infighting in west Aleppo countryside and Idlib led several smaller, more 'moderate' groups to seek protection in Ahrar al-Sham by merging under its banner. On January 28, Jabhat Fatah al-Sham came together with Hashim al-Sheikh, Harakat Nour al-Din al-Zinki, the jihadist Jabhat Ansar al-Din and two other groups to form Hay'at Tahrir al-Sham, just two days after the declaration of the merger of some factions under Ahrar al-Sham and probably a reaction to it. Within Hay'at Tahrir al-Sham, Hashim al-Sheikh was designated the overall leader, while Jowlani became the military commander. No evidence shows that Zawahiri had any role in the formation of Hay'at Tahrir al-Sham. As with the formation of Jabhat Fatah al-Sham, the speed at which the merger took place suggests that there would not have been enough time to consult with him on the matter. Following the formation of Hay'at Tahrir al-Sham, the Jordanian jurist and former Jabhat al-Nusra member Sami al-Oraidi resigned from the new entity. Oraidi had initially served as a religious official for Jabhat al-Nusra in the south of Syria before becoming the general Shari'i official for the organization. In October 2013, he outlined Jabhat al-Nusra's ideological outlook in an interview with the group's media wing. "Among the reasons for the waste of the fruit of jihad is the delay of the counsel of the 'ulama and the people of benevolence. Delaying the statement beyond the time of need is not permissible. Among the greatest disobedience is disobedience to the mother group; after it raised them as children, they disobeyed it when one of them began to learn how to speak....What the experiences in the fields of jihad have established is that if alliances are not based on Shari'i foundations and restrictions with people who have in them the quality of sacrifice and steadfastness, the harm of these alliances is greater than their benefit." Although there is no mention of Hay'at Tahrir al-Sham by name, it is clear, given the context of his resignation, that he is talking about the group, and the supposed disobedience of the parent organization al-Qaida. Oraidi continued this line of sub-tweeting-style criticism of Hay'at Tahrir al-Sham, writing a small treatise on the subject of the pledge of allegiance (bay'a) in jihadi groups. The work features quotations from a variety of jihadi personalities, such as al-Qaida's Atiyatullah al-Libi and Abu Mus'ab al-Zarqawi, in order to emphasize the need to fulfill one's pledge in giving the bay'a and not rebel against one's amirs and establish new groups. Atiyatullah al-Libi, for instance, is quoted as saying: "The establishment of new groups is not permitted except with a considered Shari'i justification that the jurists decide is a Shari'i justification." As Oraidi concludes, the bay'a can only be dissolved by "legitimate means and for legitimate reasons," meaning that there must be a clear affirmation of the dissolution by the "general amir of the group." Again, no reference is made to Hay'at Tahrir al-Sham by name, but the implication is that the breaking of the allegiance to al-Qaida was not done with the appropriate consultation of its general amir Zawahiri. In October 2017, Oraidi began to become explicit in his criticisms , responding to leaked comments made by Hay'at Tahrir al-Sham official Abu Abdullah al-Shami (Abd al-Rahim Attoun) regarding Zawahiri's speech "We shall fight you till there is no more persecution" released early that month. In that speech, Zawahiri implicitly criticizes the breaking of ties with al-Qaida, warning that the Syrian jihad risks going to waste on "political games and ruses." Besides issuing a standard call to unity, Zawahiri outlined his view of the nature of an oath of an allegiance: "binding in its nature, its violation forbidden." While he does not explicitly reference Nusra's successors by name, the implication is that the breaking of ties constituted a violation of that oath of allegiance. In his own criticisms, Oraidi offers more of the backstory to the formation of Jabhat Fatah al-Sham and Hay'at Tahrir al-Sham, saying that he had kept silent on the matters (i.e. not explicitly referring to them) for reasons such as "the interest of the field." According to him, for example, Abu al-Khayr al-Masri had no knowledge of the formation of Hay'at Tahrir al-Sham except through the media. More importantly, Oraidi says that "some time after the formation of Jabhat Fatah al-Sham, the first message came from Dr. Zawahiri," in which he rejected the project and demanded a return to the prior status-quo. Oraidi further claims that Zawahiri had described what had happened as a "violation and act of rebellion." The separation of any branch of al-Qaida requires the correct consultation in the organization, and Oraidi claims that Abu al-Khayr al-Masri thus retracted his endorsement of Jabhat Fatah al-Sham, accepting Zawahiri's argument that it was not within his competencies to approve it. On balance, therefore, the evidence suggests that the formation of Jabhat Fatah al-Sham and then Hay'at Tahrir al-Sham was not coordinated with Zawahiri. While one could see in Jabhat Fatah al-Sham an initial attempt to appease 'purists' and the idea of preserving al-Qaida's project while embedding the group even more deeply in the insurgency, the central leadership's rejection of Jabhat Fatah al-Sham and the incorporation of some non-jihadist elements into the Hay'at Tahrir al-Sham merger means that the breaking of ties can no longer be viewed as a mere media game. Rather, it has become a very serious point of contention. Besides the issue of breaking ties, there is also a rift in the approach to the war on the ground. In April 2017, Zawahiri issued an audio message that reflected a strategic divergence between him and Hay'at Tahrir al-Sham regarding the situation in Syria. Entitled "al-Sham will submit to none besides God," the message contrasted with the message released in May 2016 that portrayed the Syrian jihad as the best hope of the ummah. In this message, Zawahiri, alluding to the major setbacks suffered by the insurgency, emphasized that "victory comes with patience, ease with hardship, deliverance with affliction." As part of this message, Zawahiri offered three specific points of advice. First, there must be "critical reassessment and correction of mistakes." Second, the focus should be on guerrilla warfare rather than holding territory. Finally, the jihad in Syria must not be turned into a nationalist cause, but rather should be a jihad of the entire ummah, aiming to implement the rule of God. The second piece of advice in particular illustrates Zawahiri's realistic understanding of the overall direction of the Syrian civil war and the trend against the insurgency. Hay'at Tahrir al-Sham, however, has clearly not been following this approach suggested by Zawahiri. On the contrary, it has sought to expand its administrative capabilities. In part, this approach reflects a desire to become the face of Syria's insurgency with which outside powers must deal while insisting that the 'revolution' against the regime continues. Thus, Hay'at Tahrir al-Sham seeks to dominate over all other administrative projects of other factions in what remains of insurgent-held territory in the epicenter of the northwest. For example, on May 11, the group announced the establishment of a new foundation to monitor the market of currency exchange and financial transfers. On July 29, after inflicting major defeats on the Salafi group Ahrar al-Sham, which was forced out of the provincial capital of Idlib and the Bab al-Hawa border crossing between Idlib and Turkey, Hay'at Tahrir al-Sham's electricity administration (the General Foundation for Electricity) subsumed Ahrar al-Sham's electricity administration (the Electricity Foundation). Hay'at Tahrir al-Sham's services wing is currently called the Civil Administration for Services, a successor to Jabhat al-Nusra's Public Administration for Services. Statements issued by the administration also reflect the administrative expansion particularly since the defeats inflicted on Ahrar al-Sham. For instance, the administration has issued a statement to establish a directorate for antiquities and museums, and another forbidding the ratification of contracts for mobile and Internet networks without approval of the administration. At the same time, this administrative expansion comes at an additional cost besides the strategic divergence from Zawahiri. The international community tends to regard Hay'at Tahrir al-Sham in the same way as it regarded Jabhat Fatah al-Sham: that is, an al-Qaida front project. Therefore, the permeation of Hay'at Tahrir al-Sham into civil life in Idlib province risks jeopardizing the work of aid organizations in the area and flow of goods across the border from Turkey, for fears of abetting the growing rule of what is considered to be a terrorist organization. In turn, isolation and pariah status for Idlib are a threat to Hay'at Tahrir al-Sham financially. Thus, on July 30, Hay'at Tahrir al-Sham issued a statement that addressed the issue of operation of humanitarian organisations amid its major gains against other factions in Idlib province, declaring that "we affirm the importance of the continuation of humanitarian work in the liberated areas, for what it brings from supporting and helping our people." As part of this affirmation, Hay'at Tahrir al-Sham asserted that "we will work to entrench the principle of the neutrality and independence of the humanitarian organisations, and we will push for this principle." In this regard, an approach towards civil society has been adopted in at least some areas of its control that resembles the methods of al-Qaida in the Arabian Peninsula when it controlled the important Yemeni port city of Mukalla. Specifically, there is the issue of civilian local councils in areas controlled by Hay'at Tahrir al-Sham, and the Jabal al-Summaq area of north Idlib provides a useful case study . An originally Druze area controlled by Jabhat al-Nusra since the end of 2014, it has remained under the control of the group's successors to this day. Conversions to Sunni Islam were imposed on the local population at the beginning of 2015, in accordance with the jihadist view that the Druze are disbelievers who fall outside the framework of beliefs that can be tolerated. This policy has never been changed: a useful indicator for the question of whether the dropping of the al-Qaida affiliation has actually constituted a shift away from jihadist ideology itself. In any event, while the Jabal al-Summaq area was controlled by Jabhat al-Nusra and its successors, services were actually being provided by civilian local councils. However, following the formation of Hay'at Tahrir al-Sham, the new organisation made clear its intention to force the local councils to become affiliated with its services administration. Otherwise, Hay'at Tahrir al-Sham would form new councils to replace them. In Kaftin, one of the largest villages in Jabal al-Summaq , the local council, which was ultimately tied to the main opposition-in-exile, rejected becoming affiliated with Hay'at Tahrir al-Sham, and so Hay'at Tahrir al-Sham set up a new local council to replace it, sidelining the old local council. Yet according to Abd al-Majeed Sharif, who headed the old local council, Hay'at Tahrir al-Sham "compelled the provincial council to register it [the new local council] with them or confer with them." The provincial council here refers to the Free Idlib Provincial Council that is tied to the main opposition-in-exile. In other words, while the new local council is actually affiliated with Hay'at Tahrir al-Sham, it appears to have been registered in the name of the Free Idlib Provincial Council. This point is supported by documents obtained by this author from a resident of Kaftin featuring water and cleaning bills from this new local council for July 2017 (see Appendix). Notably, the top of the documents reads "Free Idlib Province," a reference to the Free Idlib Provincial Council. This corroborates the testimony of Abd al-Majeed Sharif, who added "our provincial council is now doing everything the Jabha [Hay'at Tahrir al-Sham] wants in compliance." 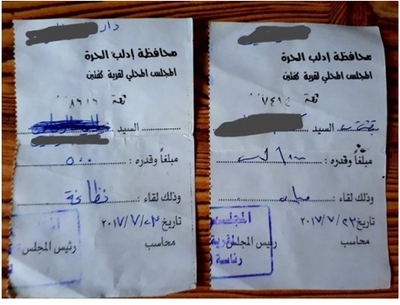 This modus operandi is undoubtedly intended to ensure that aid organizations work with the local council in Kaftin, which provides services to the population, subject to fees that constitute a source of income for Hay'at Tahrir al-Sham. For comparison, a document emerged from May 2017 in which the head of a local council pledged to affiliate the council with the Hama division of Hay'at Tahrir al-Sham's services administration. At the same time, the document specified that some relations with the Free Idlib Provincial Council could still be maintained such as in provision of relief and services support. This document lends further credence to Abd al-Majeed Sharif's interpretation. The desire to expand and unify administrative capabilities while facing potential problems of international stigmatization and subversion efforts continues to prove a challenge for Hay'at Tahrir al-Sham. As of the time of writing, the group appears to have had a hand in the formation of a "Salvation Government" to rival the wider interim government linked to the main opposition-in-exile. This rival government notably declared in its covenant that "Islamic Shari'a" should be the sole source of legislation and that "it is necessary to preserve the identity of the Syrian Muslim people," much to the approval of Hay'at Tahrir al-Sham officials like the Egyptian Abu Fatah al-Farghali. In sum, it can be seen that the relationship between al-Qaida and Hay'at Tahrir al-Sham is more complicated than the latter being a simple front group for the former. Although the media circus on the day of the rebranding of Jabhat al-Nusra as Jabhat Fatah al-Sham gave the impression of a move coordinated with Zawahiri, the evidence that has since emerged does not support that idea. The al-Qaida loyalists, despite their complaints, do not seem to be numerous or influential enough to form a real rival faction to compete with Hay'at Tahrir al-Sham, which has barred the formation of new factions in the north anyway. There is also the problem of strategic divergence between Hay'at Tahrir al-Sham and Zawahiri. While the concerns about Hay'at Tahrir al-Sham supposedly being tainted with Syrian nationalism and the jihadist ideology being compromised seem to be overblown, particularly as more obviously non-jihadist elements such as Harakat Nour al-Din al-Zinki have defected, there is a clear contrast between Hay'at Tahrir al-Sham's governance project and Zawahiri's advice to pursue guerrilla warfare. Yet the viability of Hay'at Tahrir al-Sham's project in the long run is in doubt. Whatever the complexities of the group's relationship with al-Qaida, the external perception of the organisation as an al-Qaida front is important to bear in mind when considering how the outside world regards Idlib province. Hay'at Tahrir al-Sham may insist that it can maintain the apparent independence of civil society in its areas of control, but outside donors are increasingly likely to regard that as a mere ruse and pull out of aid efforts. The Assad regime, meanwhile, will not leave Idlib province in insurgent hands indefinitely. While the insurgency cannot defeat the regime, an insurgent-held Idlib province remains a serious nuisance to cause disturbances in Hama and Latakia provinces. As of the time of writing, the priority of the regime and its allies is to secure the eastern areas from the Islamic State, partly to reclaim vital resources such as oil but also to block US-backed actors from maximizing their influence in the area. Thus, a serious regime offensive to retake all of Idlib, which would not be an easy affair, is not imminent. But an offensive of some sort is ultimately to be expected. The scale of that campaign depends in part on how far Turkey decides to expand its intervention into northwest Syria. So far, Turkey has in fact cooperated with Hay'at Tahrir al-Sham in western Aleppo countryside to deploy monitors to block any westward expansion by the Kurdish-led Syrian Democratic Forces pocket in Afrin. Indeed, Hay'at Tahrir al-Sham is publicly portraying the Turkish intervention as something that is limited. There are also suggestions Turkey is trying to play a long-game against Hay'at Tahrir al-Sham, initially cooperating with it over a shared aim while also working to undermine it from within by less confrontational methods like assassinations of officials and encouraging defections in the rank-and-file. Whatever scenario does play out, the long-term outlook is bleak for Hay'at Tahrir al-Sham as a governance project. As is the case with the contracting Islamic State, the logical outcome is resorting to guerrilla tactics. In this regard though, Hay'at Tahrir al-Sham seems less well placed than the Islamic State, which has had far more lucrative financial resources to exploit for a long time since expelling Jabhat al-Nusra from eastern Syria in 2014. The pursuit of guerrilla warfare in the end may help heal the rift between Hay'at Tahrir al-Sham and the al-Qaida loyalists, who do not necessarily see Hay'at Tahrir al-Sham as an outright enemy in the way they view the Islamic State but rather as merely being severely misguided. However, the future picture hardly tells of a success story. The organisation and the al-Qaida presence in Syria more broadly are unlikely to die out completely, but the scenario is one of an insurgency operating in largely depopulated terrain of relatively small size, not exactly comparable to the larger safe havens enjoyed by al-Qaida in Afghanistan under the Taliban regime. It may be argued that the problems al-Qaida has faced in Syria do not matter as only a few al-Qaida members are required to plot attacks against the West. However, these individuals are vulnerable to targeted counter-terrorism strikes. As for actual attacks conducted in the West at present, it is the Islamic State rather than al-Qaida claiming a higher success rate, whether through merely inspiring individuals or by communicating with sleeper operatives. It is often tempting to impute strategic brilliance to one's enemy when it is not warranted. The evolution of Jabhat al-Nusra over time into Hay'at Tahrir al-Sham is a case-in-point. E.g. Charles Lister, "al-Qa'ida plays a long game in Syria," CTC Sentinel, September 11, 2015; URL: https://ctc.usma.edu/posts/al-qaida-plays-a-long-game-in-syria . Aymenn Jawad Al-Tamimi, "al-Qa'ida uncoupling: Jabhat al-Nusra's rebranding as Jabhat Fateh al-Sham," CTC Sentinel, August 22, 2016; URL:https://ctc.usma.edu/posts/al-qaida-uncoupling-jabhat-al-nusras-rebranding-as-jabhat-fateh-al-sham . E.g. Pamela Engel, "Al Qaeda is revealing its long game in Syria," Business Insider, March 23, 2016; URL: http://uk.businessinsider.com/al-qaeda-nusra-front-goals-in-syria-2016-3?r=US&IR=T . "Assessing the Trump Administration's Counterterrorism Policy," Middle East Institute, July 27, 2017; URL: https://www.youtube.com/watch?v=UgzqabDYK7I&t=3986s . Charles Lister, "How the Russians Suckered Trump in Syria, and Iran Comes Out the Big Winner," July 12, 2017; URL: http://www.thedailybeast.com/how-the-russians-suckered-trump-in-syria-and-iran-comes-out-the-big-winner . Aymenn Jawad Al-Tamimi, "al-Qa'ida uncoupling." "Jabhat Fatah al-Sham: Un-troubling defections," al-Modon, August 26, 2016; URL: http://www.almodon.com/arabworld/2016/8/26/%D8%AC%D8%A8%D9%87%D8%A9-%D9%81%D8%AA%D8%AD-%D8%A7%D9%84%D8%B4%D8%A7%D9%85-%D8%A7%D9%86%D8%B4%D9%82%D8%A7%D9%82%D8%A7%D8%AA-%D8%BA%D9%8A%D8%B1-%D9%85%D9%82%D9%84%D9%82%D8%A9 . "Our Manhaj and our Aqeeda: interview with Sami al-Oraidi," al-Manara al-Bayda, October 21, 2013; URL: https://archive.org/details/Moqabla . Collected and saved at URL: https://justpaste.it/oraidi10feb2017 . "Responding to those asking about the ruling of fulfilling the pledge of allegiance to the groups striving to implement the ruling of the law of the Lord of the Worlds," Sami al-Oraidi, March 29, 2017; URL: http://www.jihadica.com/wp-content/uploads/2017/05/ijabat-al-sailin.pdf . Sami al-Oraidi, "For God and then for history," October 2017. Ayman al-Zawahiri, "We shall fight you until there is no more persecution," al-Sahab Media, October 2017; URL: https://azelin.files.wordpress.com/2017/10/dr-ayman-al-zcca3awacc84hiricc84-22we-shall-fight-you-until-there-is-no-more-persecution22-en.pdf . "al-Sham will submit to none besides God," al-Sahab Media, April 2017; URL: https://azelin.files.wordpress.com/2017/04/dr-ayman-al-zcca3awacc84hiricc84-22al-shacc84m-will-submit-to-none-except-god22.pdf . Copy of the statement can be accessed at URL: https://justpaste.it/htsfinancialadminmay11 . Copy of the document can be accessed at URL: https://justpaste.it/htsahrarelec29jul . Aymenn Jawad Al-Tamimi, "Archive of Jabhat al-Nusra Service Documents": Specimens N and O. "Commenting on the statement issued by Syrian organizations and committees concerning the recent developments," Hay'at Tahrir al-Sham, July 30, 2017; URL: https://justpaste.it/hts30jul2017 . Michael Horton, "The Hadramawt: AQAP and the Battle for Yemen's Wealthiest Governorate," Jamestown, July 10, 2015; URL: https://jamestown.org/program/the-hadramawt-aqap-and-the-battle-for-yemens-wealthiest-governorate/. A distinction is drawn between villages of Jabal al-Summaq on the plain (e.g. Kaftin) and those further up on the mountain. A body called "The United Mountain Council" was set up for local council services for the villages further up on the mountain. It appears to have been more compliant with Hay'at Tahrir al-Sham's demands than the Kaftin local council, despite an official claim to be independent. The United Mountain Council declared support for the Hay'at Tahrir al-Sham-supervised "Civil Administration Initiative in the Liberated Areas" in August 2017, see URL: https://justpaste.it/majlismuwahhidaug2017. Cf. "Launching of the Civil Administration Initiative in the Liberated Areas," SMART News, August 24, 2017; URL: https://smartnews-agency.com/ar/wires/239183/%D8%A5%D8%B7%D9%84%D8%A7%D9%82-%D9%85%D8%A4%D8%AA%D9%85%D8%B1-%D9%85%D8%A8%D8%A7%D8%AF%D8%B1%D8%A9-%D8%A7%D9%84%D8%A5%D8%AF%D8%A7%D8%B1%D8%A9-%D8%A7%D9%84%D9%85%D8%AF%D9%86%D9%8A%D8%A9-%D9%81%D9%8A-%D8%A7%D9%84%D9%85%D9%86%D8%A7%D8%B7%D9%82-%D8%A7%D9%84%D9%85%D8%AD%D8%B1%D8%B1%D8%A9-%D9%81%D9%8A-%D8%A5%D8%AF%D9%84%D8%A8 . "Archive of Jabhat al-Nusra Service Documents," Specimen P.
 The announcement of this government was reported on by Hay'at Tahrir al-Sham's 'Iba News Agency, November 5, 2017; URL: https://justpaste.it/hts5nov2017e . Abu Fath al-Farghali on his Telegram channel, November 2, 2017; URL: https://justpaste.it/abufathfarghalinov2 . Statement issued July 27, 2017. Copy can be found at URL: https://twitter.com/ajaltamimi/status/890903185044406277 . Sam Heller, "Tahrir al-Sham official on Turkey's intervention to implement Astana: 'That's not the reality,'" Sam Heller/Abu al-Jamajem, October 15, 2017; URL: https://abujamajem.wordpress.com/2017/10/15/tahrir-al-sham-official-on-turkeys-intervention-to-implement-astana-thats-not-the-reality/ . Charles Lister, "Turkey's Idlib Incursion and the HTS Question: Understanding the Long Game in Syria," War on the Rocks, October 31, 2017; URL: https://warontherocks.com/2017/10/turkeys-idlib-incursion-and-the-hts-question-understanding-the-long-game-in-syria/ .